Although both wasps and bees, two common stinging insects, play a vital role in Florida’s ecosystem through pollination or parasite predation, stings from either of these insects can be irritating to some and downright fatal to others. Controlling or eliminating stinging insects is one way to manage a potential problem. The two main types of wasps you’ll run into in Florida include cicada killer wasps and paper wasps. Cicada killers are large, slow to provoke, and are focused primarily on hunting their favorite prey – the cicada – wh ich they subdue by stinging it with a paralyzing chemical in order to feed their young. Cicada killers build nests in soft earth and are generally solitary, living on a diet primarily comprised of sap and nectar. They seek areas of sparse vegetation – like a golf course – crossing paths with unsuspecting golfers in sand traps. Cicada killers are slow to provoke, with males being slightly more aggressive, and if bothered, can produce and uncomfortable sting. 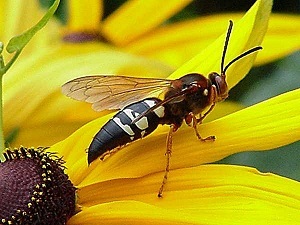 Paper wasps are smaller and feed on nectar and sap. They are identifiable by their gray, papery nests that suspend from eaves, branches, and ledges. Paper wasps are more sociable than cicada wasps and thousands of individuals may live in each nest, raising young in hollowed combs filled with larval tubes. Females have a lance-like stinger and are capable of stinging repeatedly if provoked. Honeybees, carpenter bees, and Africanized honey bees are three types of bees found in Florida. Honeybees are furry little pollinators who live in honey-filled hives and play a vital role in pollinating flowers, plants, and citrus crops. Beekeepers also maintain hives to produce honey and beeswax. Honeybees are a half inch long and are notable for their black and yellow striped bodies. Honeybees can sting, and the two main worries are allergic reaction and infection. Allergic reactions can be fatal, so immediate medical attention should be sought. Carpenter bees are slightly bigger than honey bees, ¾ to one inch long, and live in previously-excavated tunnels of woods. They are pollinators who feed on nectar and tend to be more solitary. Although they do not cause structural harm to wood, generations occupying the same area over time may cause damage. Africanized honeybees are also common Florida bees, and are a result of cross breeding European and African honeybees. With the naked eye, they are virtually identical to European honeybees – the main difference being the size of their wings. Africanized honey bees have been branded killer bees. In actuality, however, their behavior is not that different than other honeybees except they tend to be provoked quicker, will follow prey for greater distances, and respond negatively to vibrations and loud noises from motors. The same precautions taken with European honeybees should be taken with Africanized honeybees.